World To End On May 21? This is the way the world ends. Not with surprise, but with billboards. According to a series of billboards, May 21 will be the day the world ends. As always with any apocalyptic billboard, your mileage may vary. Still, the series of billboards, across the US and Canada, has some folks worried, even if the radio station organization itself isn’t asking for any money or attempting to solicit donations from apocalypse-frightened listeners. The billboards are funded by Family Radio, a group of 66 Christian radio stations that produces and distributes Christian content around the world. 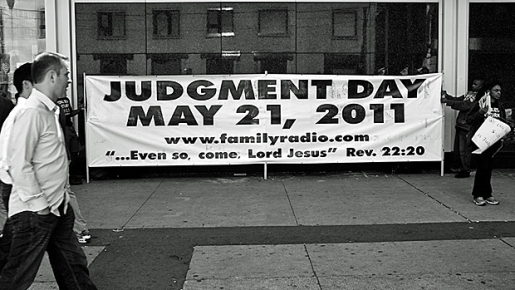 According to Family Radio, their president Harold Camping discovered the date of the apocalypse during a reading of the Bible. Upon further study, he decided that his math was right and that May 21 would be the date Jesus returns, with the earth’s final day (when the earth is destroyed and the last survivors killed in their luxury bunkers) being October 21, 2011. Camping previously predicted the world’s end in 1994. I really hope the earth doesn’t end on May 21; I’ve got concert tickets and no access to survival suits or a zombie-proof house-fortress!